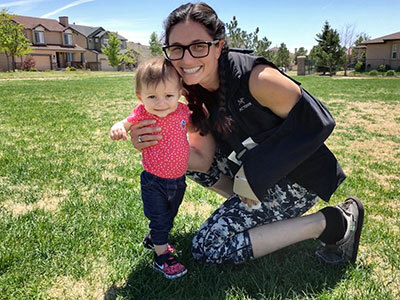 Rock climber Ilana Jesse with her 10-month-old daughter after her accident. A group of experienced climbers were about 1,500 feet up Hayes Glacier in the Eastern Alaska Range when a boulder about two feet in diameter was dislodged. Though Ilana Jesse tried to get out of the rock’s path, it hit another boulder and crushed her left hand. “My hand was in extremely bad shape,” the climber said. Jesse needed medical attention as quickly as possible. Her hand was at risk for amputation, so she was airlifted to Harborview Medical Center in Seattle, WA. Meanwhile, a bush pilot got the remaining rock climbers safely off the glacier. Chapman flew to Seattle that night after getting Jesse’s ticket fully refunded. He went straight to Harborview, where his friend had four surgeries in one week, each lasting four to six hours. Doctors were able to save Jesse’s hand. When the time came for Chapman to fly home to Denver, Alaska customer service agents said they would be more than happy to check all nine bags — weighing 400 pounds — free of charge. “How is your day going?” Alaska Airlines Captain Chris Cice asked a woman onboard a recent flight from Dallas to Anchorage via Seattle. Alaska Guest Hannah Wilder witnessed the exchange from a couple rows back and was so blown away by Cice’s simple gesture, she later posted her appreciation for his kindness on Facebook. For more than 20 years flying with Alaska, Cice has made a point of greeting each guest. He visits with them in the gate area and then, time permitting, makes his way through the cabin, eliciting smiles from children and others. He’s even led rounds of “Happy Birthday” for guests. Alaska Million Miler Mike (John) Szymanski, 72, has lived in Alaska his entire life and grew up flying Alaska Airlines. Earlier this month, his son and daughter-in-law were in Rochester, Minnesota at the Mayo Clinic. His son’s wife Kelsey was given difficult news that a third surgery was required for a cancerous growth in her mouth and would delay their return home to Alaska. “We knew this was very serious and our stress levels were out of sight,” Szymanski said. Szymanski’s wife called Alaska Airlines and reached Vicki Carlson, a Boise reservations agent. “Their family was, and still is, going through a tremendous amount of stress due to their daughter’s health situation,” Carlson said. She promptly took charge of the situation, changing their reservations and rerouting their trip to shorten their journey back to Alaska. The Szymanskis we’re relieved. Carlson says she never really knows who is on the other end of the line, but tries to put herself in their shoes and do what’s right for each guest. “The best part of my job is that I get to help guests solve their problems and figure out solutions,” she said. Have a great Alaska Airlines story? Share it with the hashtag #iAmAlaska. 1 comment on "3 feel-good #iAmAlaska stories we love"
want to switch from Delta.